This giveaway is Sponsored by Bona and hosted by Mom Does Reviews and her fabulous blogger friends! We only have one area rug in our house which is the only carpet we have the rest is all different types of flooring which means we do a lot of mopping! This mop sound awesome! The Bona® Hardwood Floor Mop – Curve® is a durable floor mop with a sleek curved design to effectively clean hard-to-reach spaces. Premium, no-residue Bona® Hardwood Floor Cleaner and washable Bona® Microfiber Cleaning Pad included. Get $5 off the mop and $5 off shipping – a $10 value. Sign up HERE to get your $$ savings! 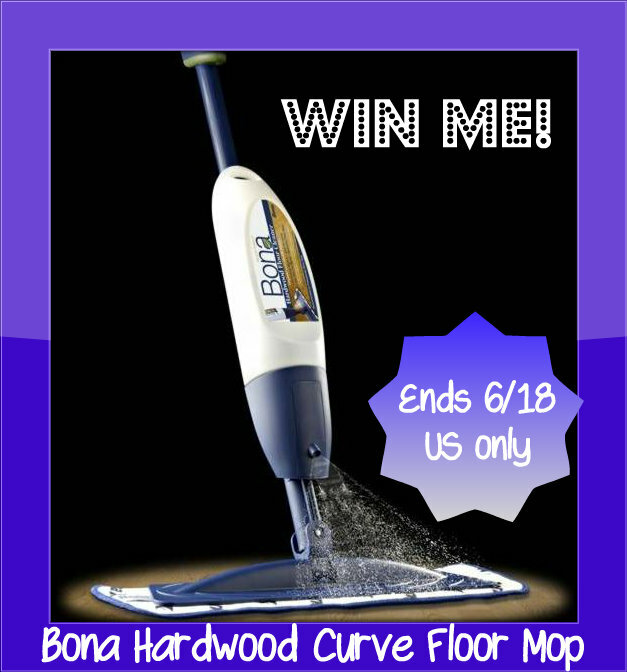 One lucky reader will win the Bona Hardwood Floor Mop- Curve AND a pack of Wet Cleaning Pads! Be sure to complete the mandatory entry! we have all 3 in our house! We have tile and hardwood floors so this looks amazing to keep them clean. We have ceramic tile and carpet. I have hardwood throughout and tile in the bathroom. Tile and carpet. Will be replacing the carpet soon to hardwood floors. We have carpeting on the front stair case, in one bedroom and on the sunporch floor and ceramic tile in the bathroom: other than that, every room every room (including the back stairway – 3- stories) are all hardwood floors. They are beautiful OAK and they are very very old (close to 100 years) so we have to take very, very careful, extra good care! We would love to have this wonderful mop! We are in the process or ripping out the carpet and going to put wood in. Hardwood in the whole house baby!!! Real hardwood too! I have all three in my house. I have all three in my home but hardwood is the worst to clean. We have laminate flooring in our home. We have carpet, and tile in our house. Hardwood, laminate and carpet! This product would be awesome. My home has hardwood and carpet. We have hardwood and tile in our home. We have all three. Thanks for the giveaway! We have hardwood and tile in the bathrooms. Most of our house is hardwood, except for the kitchen and bathroom which are laminate and tile. I really had to adjust to new ways of cleaning! I have carpet, hardwood, and vinyl floor in my house. Plus several dogs, so I could use this! LOL! Hubby and I put down a wood floating floor in the kitchen a few years back. We pulled up all the green shag, yes shag, out of the living room and 2 of the bedrooms and sanded and pollied the hardwood floors in those rooms. My bedroom still has the green shag, uh yeah shag, but not for much longer. Last room but working on the remodel now. I love my hardwood floors!! He tiled the bathroom floor a few years back too! So much better than the green seafoam colored tile that was in there!! Yeah we bought a fixer upper 25 years ago. Getting it done a little at a time! Hardwood and tile flooring for us! Not a scrid of carpet, thankfully! We have all three types of flooring in our house. We are getting rid of our carpets one room at a time and changing to wood. I have all 3, hardwood in kitchen, tile in bathroom, and carpet in Bedrooms and livingroom. I have hardwood floors and tiles. I have hardwood in the living room, dining room and bedrooms. I have tile in the kitchen and bathroom and carpet on my stairs. We have all three ~ tile, wood and carpet. I have hardwood and carpet! Our whole home is hardwood or tile! I have hardwood floors, carpet and tile. I have hardwood & tile floors. All 3, carpet, hardwood, and tile! We own an older home. It has beautiful hardwood flooring. It’s very hard to keep it clean in between the planks. We have mostly carpet.. tile in the kitchen and bathroom. Hardwood throughout the house, laminate in the kitchen and bathrooms. My home has mostly carpet, but I would love to gift this to my son who has all hard wood flooring! This giveaway will go to my elderly parents. They have hardware and tile floors throughout their house. All hardwood w tile in kitchen. I have all hardwood also w 1 area rug. Alot of mopping in my home too. Carpets and tiles I have in mine. I actually have all of the above. But mostly old carpet that needs to be taken out & replaced with hardwood! And tile in the bathrooms. Most everything really does need to be replaced. I have all three, though I would love to tear out my carpet and have only wood flooring. I have all of the above. We have hard wood, except kitchen & bath is tile.